This is a list of the bird species recorded in Poland. The avifauna of Poland include 446 species, of which six have been introduced by humans and seven have not occurred since 1950. This list's taxonomic treatment (designation and sequence of orders, families and species) and nomenclature (common and scientific names) follow the conventions of the Polish Fauna Commission (Komisja Faunistyczna). 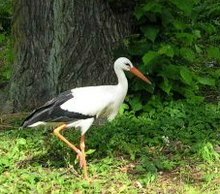 The Polish names of the birds, with their scientific names, are in the Polish Wikipedia article. This page was last edited on 26 August 2018, at 18:02 (UTC).